Pine State Regional Center, LLC, a subsidiary of the Arkansas Capital Corporation, is designated as an EB-5 Regional Center by the United States Citizenship and Immigration Services (USCIS). Drawing on a combined 92 years of experience, we are dedicated to continuing that success through our EB-5 investment offerings, providing confidence and security for our EB-5 investors. With our corporate family’s long history and experienced team of finance, legal, and lending professionals, we offer opportunities for foreign nationals to obtain permanent residency in the United States through the EB-5 Immigrant Investment program. Although Pine State is a private entity, Pine State works in close cooperation with the State of Arkansas, Arkansas Economic Development Commission, and other community and business leaders to finance successful, job-creating projects throughout Pine State’s service area. Pine State Regional Center uses project-screening methodology with in compliance with USCIS standards, federal government program underwriting guidelines (SBA, USDA, Department of Treasury), as well as traditional commercial financing and underwriting standards. Our thorough due diligence process and team’s past experience allows us to evaluate each project to create investment opportunities for our investors with a solid exit strategy for project success. 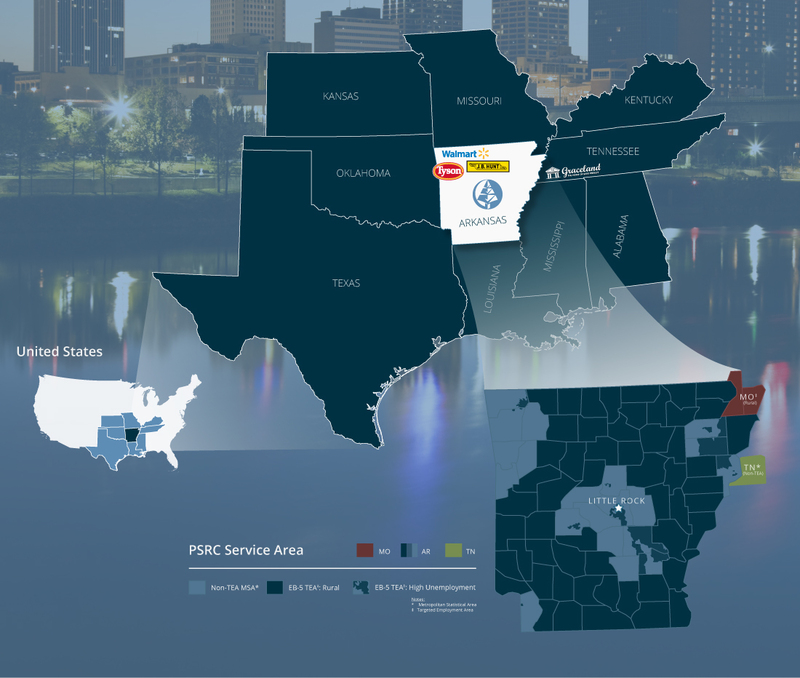 Pine State Regional Center is headquartered in Little Rock, Arkansas, and its service area includes the entire State of Arkansas as well as parts of Tennessee and Missouri. This centrally located part of the U.S. has long been a boon for business and includes one of the largest transportation and logistics infrastructures in the world including Interstates 55, 30 and 40, as well as over 1,600 miles of Class I railroad, and many world-class ports along the Arkansas and Mississippi rivers. This location includes some of the world’s largest corporations such as Walmart, Tyson Foods, Murphy Oil Corporation, and JB Hunt Transportation. Pine State Regional Center received its designation from USCIS in 2014 as an EB-5 Regional Center and is eligible to solicit qualifying investments from foreign investors and administer those investments under the EB-5 Program. All EB-5 investments must be at risk capital and invested in an approved project in compliance with the EB-5 (Employment Based 5th Category) program administered by USCIS.We are committed to administering projects throughout the immigration process to meet the needs of investors in compliance with the EB-5 program. We work closely with each investor and their immigration counsel to ensure the timing of the investment is coordinated with the visa application process.